I have a new release, and I’m very excited about this book. 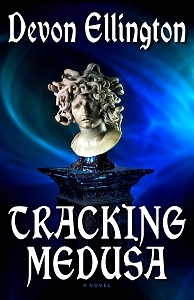 It’s a paranormal mystery with touches of romance in it, called TRACKING MEDUSA. Archaeologist Dr. Gwen Finnegan is on the hunt for her lover’s killer. Historical researcher Justin Yates bumps into her, literally, on the steps of the New York Public Library, and comes to her aid when she’s attacked, sparking an attraction between them in spite of their age difference. After avoiding a cadre of pursuers at the Met Museum, Gwen impulsively invites Justin to hop a plane with her to the UK. The shy historian, frustrated with his failing relationship, jumps at the chance to join her on a real adventure. That adventure takes them through Europe, pursued by factions including Gwen’s ex-lover and nemesis, Karl, as they try to unspool fact from fiction in a multi-generational obsession with a statue of the goddess Medusa. You can read an excerpt when you visit the site for the Gwen Finnegan Mysteries here. I’m putting photos from the Met and the Library and some of the places in Edinburgh and Ayrshire up on the website: http://gwenfinneganmysteries.devonellingtonwork.com. DE: Not traditionally. In 2013, I was able to take, through Coursera, an online class with Sue Alcock of Brown University called “Archaeology’s Dirty Little Secrets”, about some of the basics. I loved it, and I was lucky enough to head from the Cape to Brown to meet her. In fact, she got me back in touch with one of my favorite playwrights from my early days in New York theatre, who’s now teaching at Brown. In the edits, I fixed a few glaring errors in the manuscript, but I still have made, shall we say, “adjustments” in proper process to serve the needs of the story. I hope Sue will forgive me — and I plan to study more with her if the opportunity arises. DE: You’ll have to read the books to find out! How’s that for avoidance AND self-promotion! 😉 Seriously, the second book, THE BALTHAZAAR TREASURE, is about salvaging a pirate ship, and there’s a murder, AND Gwen and Justin face new obstacles in their relationship. There are definitely some surprises in that one, for readers who think they have a handle on Gwen and Justin! It will shortly be available on Amazon, and the print version releases in Mid-June.